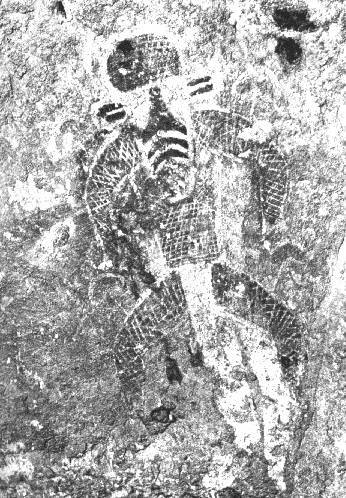 The Bee Man of Tassili n’Ajjer. Tassili n’Ajjer (Berber: Tasili n Ajjer, meaning “Plateau of the Rivers”; Arabic: طاسيلي ناجر‎) is a mountain range in the Algerian section of the Sahara Desert. It is a vast plateau in south-east Algeria at the borders of Libya and Niger, covering an area of 72,000 km2. The range is noted for its prehistoric rock art and other ancient archaeological sites, dating from the Neolithic era when the local climate was less dry, savannah rather than desert. The art is no older than 9–10 millennia, according to OSL dating of associated sediments, but may be younger. The art depicts herds of cattle, large wild animals including crocodiles, and human activities such as hunting and dancing, inckludingthis depiction of a bee headed ‘shamen’ figure. For the bee in popular culture see YouTube: Arthur Askey ‘The Bee Song’. Thanks Bill – much appreciated!